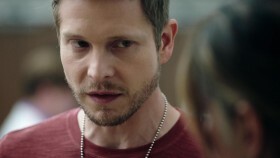 Conrad goes head-to-head with Bell after he recommends one of Julian's risky medical devices to Zoey, who's already lost one son and is back in the hospital with the other. Nic fears that Conrad may be getting overly attached to his patient. Meanwhile, Mina and Austin grow closer while working on a difficult heart transplant, Devon embarks on a very difficult day and Dr. Lane Hunter returns.